How did new species arise? How did new ways of life and new adaptations to the surroundings evolve in our early ancestors? And how did new species arise? These questions are at the heart of understanding the evolutionary origin of our species and how the unique characteristics of humans arose over time. The paper by Rick Potts and Tyler Faith examines how African climate influenced the development of early human adaptations and the origin of species. Nearly all of the most important events in African human evolution over the past 5 million years took place during long periods of climate instability. 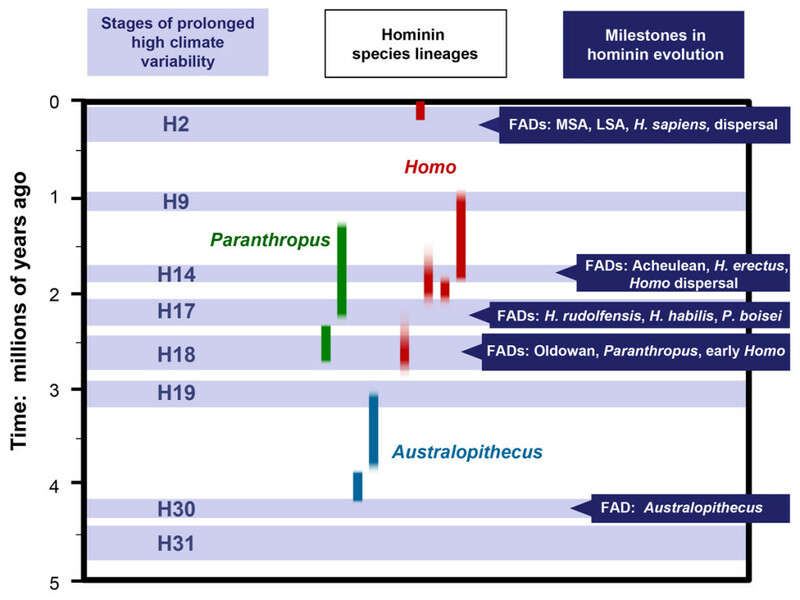 This figure shows the eight longest eras of predicted high climate variability (shaded horizontal bars) and also the first appearances (FADs) in East African hominin (early human) evolution. The FADs refer to the oldest known fossil or archeological evidence of genera and species, key technological innovations (earliest known appearances of the Oldowan, Acheulean, Middle Stone Age, Late Stone Age), and dispersals (early Homo and H. sapiens). The bottom and top of the shaded horizontal bars represent the ages of these longest-duration high variability stages. Vertical color bars show the age ranges of well-established hominin species of East Africa for the past 5 million years. The authors find that nearly all the important milestones in African human evolution occurred in long periods of strong climate fluctuation. These milestones are indicated by the oldest known fossils of the major evolutionary groups Australopithecus, Paranthropus, and Homo, and also the human species Homo sapiens. The key milestones also include major innovations in African stone tool technology, known as the Oldowan, Acheulean, Middle Stone Age, and Late Stone Age. Dates for the two main dispersals beyond Africa – the earliest spread of the genus Homo to Eurasia and the onset of the worldwide dispersal of Homo sapiens – also coincided with predicted periods of strong fluctuation in African climate. This close association between evolutionary milestones and climate variability means that the major theme in human evolution is adaptability, the capacity to adjust to changing and unpredictable environments. For many decades the standard thinking was that human ancestors evolved in particular types of habitat – the grasslands of Africa or the ice ages of Europe. This led scientists to concentrate their attention on the overall trends toward a drier and cooler environment as a major driver of human evolution. An alternative idea published by Potts in 1996 is the variability selection hypothesis. According to this idea, times of highly variable environment posed the most critical challenges to organisms in their ability to find food and water, and thus to survive and reproduce as the environment shifted back and forth between wet and dry, or between warm and cold. The variability selection idea was developed to help explain how organisms can evolve a greater capacity for adaptability, not just a better capacity to adapt to any single environment. Potts and Faith’s article finds a way to test this idea. One of the keys is understanding how African climate has varied over time. The authors examine variations in Earth’s orbit, which cause shifts in African rainfall, and precisely define the switching back and forth between unstable (strongly fluctuating) and more stable phases of climate over the past 5 million years. They define 32 high variability stages and 31 low variability stages. The paper then uses three approaches to testing the importance of climate variability in explaining human evolution in Africa. First, the paper shows that African landscapes inhabited by early humans were indeed highly variable during the predicted longest stages of highly variable climate. Second, the authors use a quantitative method to demonstrate that nearly all the key milestones in human evolution coincided with one of the eight most prolonged eras of highly variable climate. The authors’ third approach looks to East Asia when the earliest members of the genus Homo arrived. They find that the oldest populations in northeast Asia were able to occupy widely varying landscapes of forest and grassland. Populations probably of the species Homo erectus had invaded habitats ranging from 40oN to 7oS latitude, encompassing cool temperate to warm equatorial settings. The authors conclude that adaptability was the hallmark of human evolutionary success over the past 5 million years. Strong fluctuations in climate and times of highly unpredictable environment were among the most important forces of natural selection and speciation in the ancestry of humans. Alternating high and low climate variability: The context of natural selection and speciation in Plio-Pleistocene hominin evolution.